Anemia is fairly common, but its many etiologies complicate diagnosis. It affects more than one in five black and Hispanic people, one in 10 seniors and one in five of those over the age of 85. 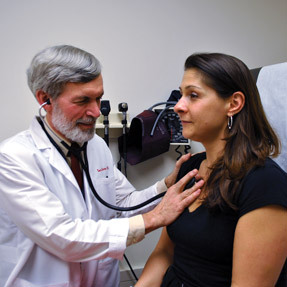 Learn how to fine-tune the diagnosis to best help patients. Everyone wants to have a physician who understands what they're feeling, but it's not just about human contact; better clinical outcomes can result from physician empathy. Early detection of pulmonary embolism is critical, which puts the primary care internist on the front lines of preventing a patient's continual deterioration that culminates in death. Patients are as likely to present in the office with symptoms as they are at the emergency department. True engagement requires listening and learning, making patients and families partners not just in decisions about their individual care but in designing practices and systems that will work for them. Learn how doctors can best spot anemia, or improve patient relationships and possibly outcomes by using empathy. The reset compliance date of Oct. 1, 2014, means that internists must move forward with transition and education plans for using the new ICD-10 codes. Start by examining documentation needed to assign the new codes. Value-based payments are meant to adjust Medicare and Medicaid payments according to performance. Take concrete actions to recoup more reimbursement and avoid nonparticipation penalties. Meet the incoming Chair-elect of the Board of Regents, the new Treasurer and new Regents who will be confirmed at Internal Medicine 2013. Learn about the upcoming products, programs and services that will be offered at Internal Medicine 2013 in San Francisco. A 45-year-old woman is evaluated in the emergency department for headache and impaired consciousness 60 minutes after onset of symptoms. She has a history of hypertension treated with lifestyle modification. The patient has a 20-pack-year smoking history. On physical examination, blood pressure is 158/68 mm Hg, pulse rate is 68/min and regular, and respiration rate is 16/min. Nuchal rigidity is noted. The pupils are reactive and symmetric in size and shape. On neurologic examination, the patient requires constant painful stimuli to follow commands and answer questions and moves the left side of the body less than the right. Results of funduscopic examination are shown. What is the most appropriate diagnostic test?.